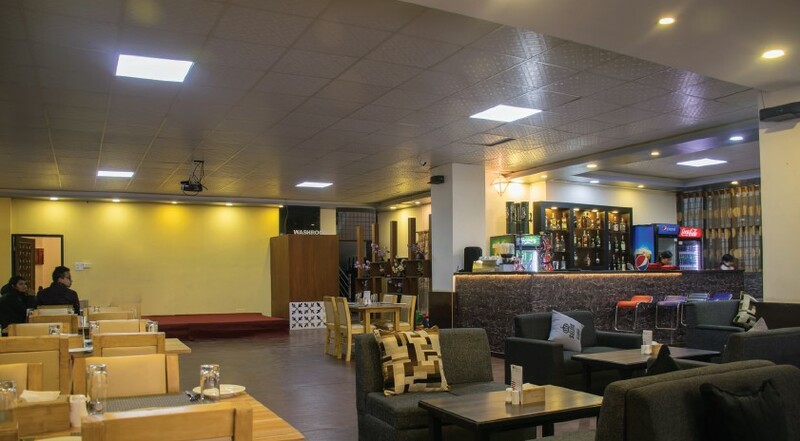 Alpas Restaurant and Lounge provides a delicious fusion of multi-cuisine in a delightfully cozy atmosphere. The executive chef and the sous chef have created their own menu of dishes—a fusion of Indian and continental, which the restaurant specializes in. As we stopped in front of Alpas, it looked like any other lavish restaurant in Lazimpat. It has its own parking, though, which is already a plus point for the place, in Kathmandu. Not knowing what to expect, we opened the door and immediately stepped into a different environment. I'd like to describe it as serene, with perfect lighting, soothing décor, and chic arrangement of seats, which is not a surprise, really, for a lavish restaurant such as this. There's music in the background to lighten up the mood. There's also a stage that comes to life every Friday night, but for now, the restaurant is quiet and calm, which just serves our purpose. We're greeted warmly by the friendly staff and immediately taken to a table, from where I run my eyes around the room. I'm impressed by the efficient arrangement of tables; comfortable sofas, chairs, and carpets in a compact area. There's also a lounge, dining area, meeting room, and even a kids section—really, something for everyone. My attention to the décor was broken with the arrival of the first dish, a shrimp cocktail with lush green leaves on top. All I can say about this is, it smelled like shrimp. It didn’t impress me, because it was like any other shrimp cocktail, except for the tangy sauce, which caught my attention. Next up was something that looked like some threads on small yarns. It was my first time with the Crispy Thread Chicken, the name given rightly so, and to me, they didn't look like chicken at all, but were very inviting, with tantalizing aroma and appetizing color. Popping one into my mouth, I closed my eyes, as it started to melt in my mouth, and I wanted to savor every bit before it did. I have to say, this dish is one of the best forms of chicken I've ever had, and will probably go back there just for this. The sauce accompanying it reminded me of titaura—sweet, sour, and mildly hot, one of the best combinations for a sauce there could be. The dish that can fool you is Seafood on a Hotpan, which sounds exotic, but is not (but only when you look at it). To me, it appeared like some noodles covered with rich shrimp gravy. If it were put on display, you wouldn't pick it over others, but wait till you taste it! The pasta is perfect al-dente, smooth and tender. And, the seafood is actually a combo of basa fish, squid, and prawn, topped with laugama sauce, a special sauce made from chicken. The combination of seafood on the plate is amazing to taste, and it goes very well with the pasta. However, I'm not very big on seafood, and so, I couldn't appreciate the dish in its totality. But, I fell in love with the Naan Chizza, our main course. You can probably guess by its name, it's got naan, pizza, and cheese, but it also has much more. It's an Indian cuisine with a continental fusion, which Alpas prides itself in. It looked like an overweight pizza, which is a delight for the eyes! The real deal is when you cut it—the layers are revealed—naan, pizza, butter chicken, and a whole lot of cheese! If you're a cheese or a pizza lover, this is what heaven feels like. Every bite of it was juicy, cheesy, and chewy. It was really thick cutting into, took a while to chew, but you got to savor every moment of it, which I didn’t want to end. However, it is also somewhat heavy, and one slice can fill you up. I didn't want to part with this Naan Chizza, the spirit was willing, but the flesh was weak. I loved the whole experience of dining there. If you feel satisfied after a meal, then you can say that it is good, but if it makes you feel happy, it's definitely great. Alpas made me happy, and I will definitely be going back there for more. If you want to have a happy food experience, you certainly need to be here.